***এছাড়াও আমাদের ঠিকানায় এসে পণ্য দেখে পণ্য ক্রয় করতে পারেন। আমাদের ঠিকানাঃ Shop-801, Level-8, Suvastu Arcade IT Park, 46-48 New Elephant Road, Dhaka-1205. DigitalX TM-18 4.1 Multimedia Speakers are ultra-compact speaker that improves your audio experience with powerful, room-filling sound. Elevate your sound experience with DigitalX TM-18 4.1 Multimedia Speakers deep bass, knockout sound quality. Tune the volumes and equalizer with remote control. Integrated Bluetooth technology makes it easier to enjoy wireless sound around the house. It also comes with built-in features including USB / SD card support, FM streaming and remote control. 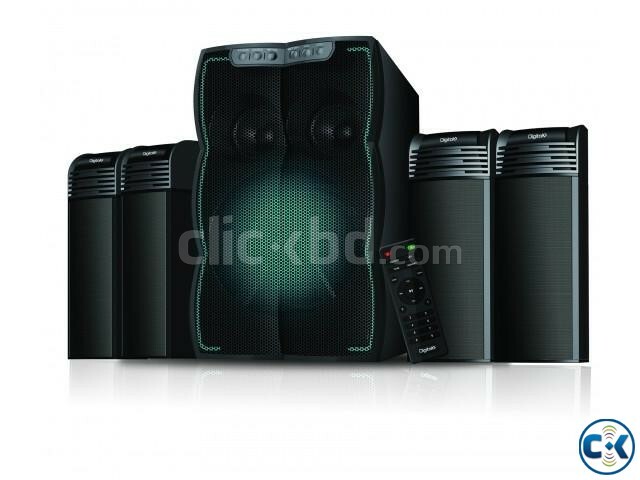 DigitalX TM-18 4.1 Multimedia Speakers sound systems comes with 2 high resolution satellite speakers which is built with 4 powerful speakers for loud and extended sound quality and 1 powerful woofer for authentic and precise sound. It gives you the performance to experience more realistic and more immersive sound. The cutting edge design of DigitalX TM-18 4.1 Multimedia Speakers easily fit into any space, any room in your home. The sleek black design integrates seamlessly, outstanding shaped speakers that keep the profile low and pump out big sound. With the remote control you can get the full advantages to control the sound, bass, volume level, and equalizer. The remote is operated by portable batteries and the best way to live with music. The signal strength is pretty great and it can control the speaker from a distance. DigitalX TM-18 4.1 Multimedia Speakers give you the opportunity to listen to FM radio with the best sound quality and the clarity of the channels is very high. You can shift to channels easily with the remote control. The FM doesn’t require any external antennas as the signal strength is good enough for the stable connection.